Over the years, Hermes has dominated the “tracking raid cooldowns” space for World of Warcraft addons. However, I’ve always run into issues with it. The addon would randomly not track some cooldowns. For example, we’d have two restoration shaman and the addon would tell me that the raid has a total of one spirit link totem. It was hit or miss, so I chose to miss. Having a raid cooldown tracker that randomly forgets important cooldowns does more harm than it is worth. A few years ago, Blood Legion released one of their proprietary raid addons to the public – Blood Legion Raid Cooldown. This addon was far more reliable than Hermes, but was only being very sporadically developed for the public. In fact, originally you needed to download the zip files off of a random file upload website. Eventually it was developed more and released on the Curse network. However, I personally still encountered similar issues with BLRCD that I experienced with Hermes (albeit, far less frequently). There isn’t an official name for the project, likely because it is just a weakauras string, but I’ll refer to it as the “WeakAuras Raid Tracker” for now. At first I was skeptical, “How will a weakauras string track what full fledged addons frequently have trouble with?” Despite this suspicion, after using this string for a full raid night with zero issues, I’m sold. The string does an excellent job of tracking cooldowns as well as keeping track of charges for cooldowns with multiple uses before triggering a cooldown (something Hermes and BLRCD still struggle with). 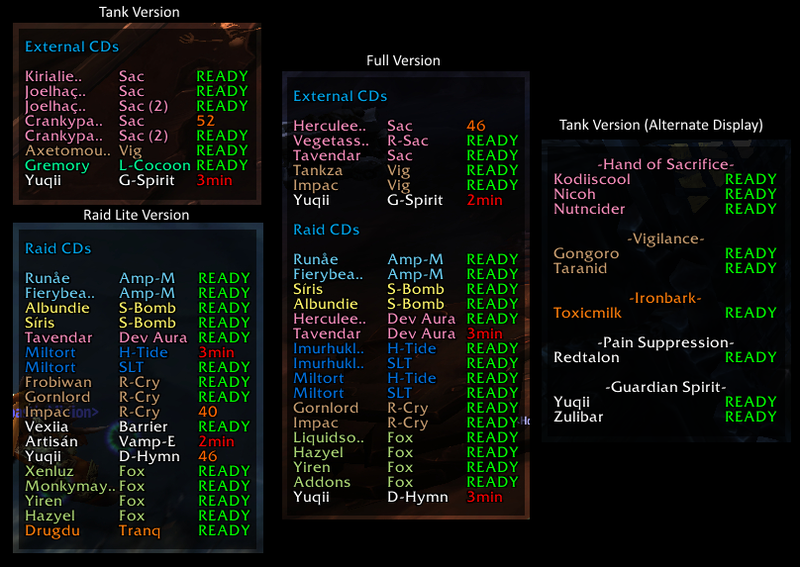 The display is very simple and efficient – a text list that shows all the tank external and raid-wide cooldowns, stating if they are ready or on cooldown (including time remaining on cooldown). Surprisingly, the string has pretty low memory usage. I expected this huge weakauras string to hog a ton of memory – nope! Overall, I highly recommend checking out Yuqii’s weakauras string and consider making the swap from Hermes/BLRCD to it. Additionally, as with all weakauras strings, you can edit it to fit your personal needs. Easily edit the weakaura in game to add/remove anything you want. If you haven’t already, please take the time to check out Yuqii’s reddit thread and give it an upvote if you enjoy! It is really superb work and deserves recognition. Follow the instructions on the reddit page for quick installation. Best of luck, and happy healing! Click here for the WeakAuras Raid Tracker! Yuqii has released a version two of his raid tracking weak aura. Some major improvements, including tracking player deaths, make it even better than before. Check it out by clicking here!